OpenWRT is a complex system with many components that depend on one another. To successfully build a working system, a good starting point is to to download a set of files tested by the OpenWRT development team. I divide OpenWRT files into four categories. In the first category are OpenWRT core files. These files are for building essential components, such as the Linux kernel or BusyBox. 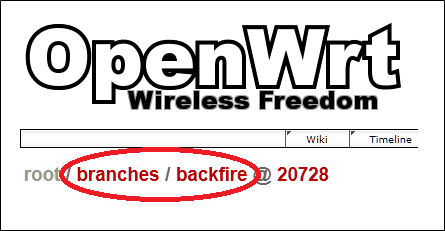 The other three categories are all OpenWRT “feeds”. A feed provides additional packages that expand OpenWRT’s features. In the second category are LuCI files, and in the third are xWrt files. The development teams of LuCI and xWrt work closely with the OpenWRT team. In the last category are files for building all other packages. For example, software RAID and multimedia packages are in this category. Each revision number is actually a hyperlink to a project tree in a repository. This is convenient because we need know the core’s location in OpenWRT repository. where “URL” is a project’s URL, “REV” is the revision to check out, and “WORK_DIR” is the directory for checked out files. After the download or update is finished, the working directory holds a set of tested core and feed files. To build OpenWRT, just install packages, select the correct configuration, and run “make”. Ensuring the correct revisions are specified in the feed configuration file often fixes this problem.